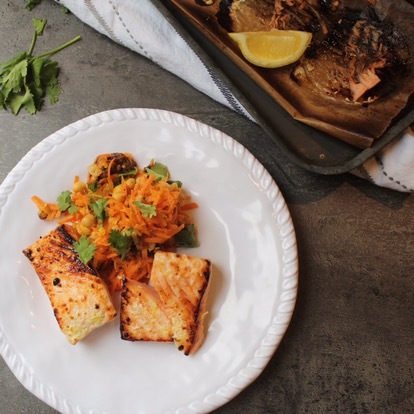 While this quick and super healthy dish is great the day it’s made, it’s even better once it’s had a few days of marinating, so it’s a good dish to make in bulk which always gets a big tick in my busy household. This is a cold salad so perfect for taking to work the following day. Chickpeas are rich in Vitamin B6 which helps support your immune system and carrots contain healthy amounts of carotenes which help nourish the thymus gland which is responsible for much of the body’s immune system. I like to eat this dish with grilled Salmon which contains vitamin D, amongst other highly important vitamins, minerals and fatty acids. Vitamin D is a nutrient that triggers the body’s immune cells that kill invading bacteria and virus. I’ve also added a good dose of ginger for not only for its spice but also it’s detoxifying qualities. 500g Organic Salmon, Cut into 80-90g peices with the skin off. 1. Place the drained chickpeas in a large bowl. Crush them slightly using either your fingers or a potato masher. 2. Add the grated carrot, garlic, ginger, chopped apricots, lemon juice and zest, cumin, olive oil and herbs. Season with salt and pepper and mix well. Leave to marinade which you prepare and cook the salmon. 3. Mix the yoghurt, lemon juice and zest and salt in a bowl and add the salmon and mix well coating it in the marinade. 4. Heat your grill or skillet and cook the salmon for 3-4 minute per side, turning once, taking care not to damage the salmon as you turn. Use a fish slice to do this. 5. Serve the salmon with the chickpea salad and a wedge of lemon.